I have been soo busy lately I haven't had much time to post, so to catch up..
December 1st and 2nd I had an art show at the ArtCraft building downtown (thanks to Mark!!). It went really well for me- we were really busy all day. I only got a couple minutes at the beginning and ends of the show days to wander around and see the other fantastic artwork on display there. Next-to-last show of the year. 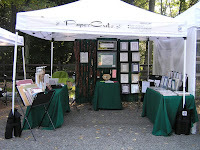 Saturday was a BEAUTIFUL day for an outdoor show.. and especially fantastic for October! We were right next to a nice area of metroparks and we were under shade for most of the day so 80+ degrees wasn't as bad as it could have been- though most of us left all the sidewalls off our tents so we could catch all the breezes that came by. The show was really light in terms of customer traffic, but I got to talk to a number of interesting people in the process.. And I got a lot of small carved ornaments finished while I was sitting there, which I needed to do since my stock was getting really low.